Resolved, That the Mayor be authorized and requested to take such steps as he shall deem proper and expedient to procure the passage of an act of Congress at the present session relinquishing to the City of Chicago all the right, title, and interest of the United Sates in and to the streets and public ground in Fort Dearborn Addition to Chicago, with authority in said City of Chicago to sell and convey so much of the latter as lies east of Michigan avenue and south of the south line of Randolph street for the erection of a railroad passenger depot. A bill to confirm to the City of Chicago the title to certain public grounds: That all the right and title of the United States to the streets and grounds dedicated to public use in that part of the City of Chicago in, the State of Illinois, known as “Fort Dearborn Addition to Chicago,” subdivided and platted under the authority of the secretary of War in the year 1839, be and the same hereby is relinquished and granted to the said city and its successors, with authority to sell and convey so much thereof as lies south of the south line of Randolph street and between the east line of Michigan avenue as now laid out and improved and the roadway of the Illinois Central Railroad Company for the erection thereon of a railway passenger station-house and other purposes incident thereto: provided, that nothing herein contained shall deprive the owners of contiguous lots of any valid right or claim, if such exists, to compensation on account of the change of use to which the public ground herein authorized to be sold and conveyed was originally dedicated by the United States. So … once again the city fathers make an attempt to sell the city’s lakefront property, showing how close we came to having no lakefront in the central city at all today. The first attempt at making a deal occurred in 1869 when the Illinois General Assembly passed legislation allowing the sale of property north of Monroe Street and west of the Illinois Central trestle for the sum of $800,000. Additionally, the area east of the railroad tracks and a mile east into Lake Michigan was to be given to the Illinois Central to build a harbor for the city. The plan raised a storm of public indignation, and the city refused the initial part of the $800,000 when the railroad offered it. Out of the 1880 legislation a railroad station did get built – for the Baltimore and Ohio railroad, which had obtained trackage rights from the Illinois Central Railroad. It would be decades of litigation before citizens could finally be assured that the property on the lakefront would be protected. It would be nearly a century before the railroads would, for the most part, leave the city’s front yard. The above photo shows the lakefront in 1858, dominated completely by the railroad and warehouses. December 11, 1911 – At a meeting of the Chicago City Council Mayor Carter Harrison reveals that an agreement has been reached between the South Park commissioners and the Illinois Central railroad in which the city will take possession of the lakeshore between Park Row on the south end of what is today Grant Park and Fifty-First Streets. The Chicago Daily Tribune says of the deal, “These riparian rights, heretofore held in the grip of the railroad, have a value to the citizens of Chicago that is considered by the park commissioners beyond computation, considering that they will now be enabled to construct a shore boulevard drive between Jackson and Grant parks, with bathing beaches, pleasure piers and islands.” [Chicago Daily Tribune, December 12, 1911] A direct result of the agreement will be a place between Twelfth and Thirteenth Streets for the Field museum after the railroad tears down its central station and associated outbuildings in that area. The railroad will also lower its tracks below grade north of Twelfth Street, in effect hiding its operation as much as possible from sight. There are dozens and dozens of other stipulations in the agreement, but there is probably no other document in the city’s history that has done more to create the extensive green space along its shoreline than this one. 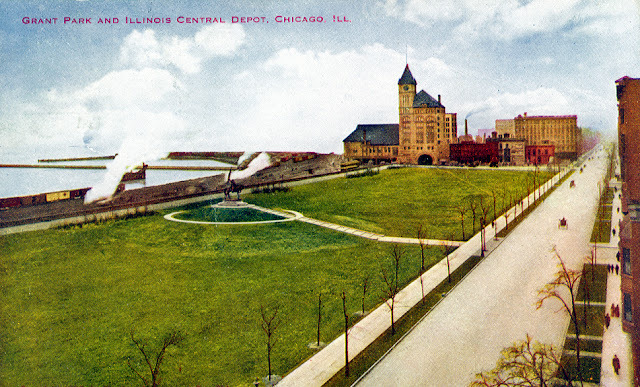 South Park Board President John Earton Payne says the agreement will make the connection between Grant Park and Jackson Park “the most beautiful parkway and drive in the world.” The above photo shows the south end of Grant Park and the Illinois Central terminal in 1911. The statue in the middle of the park is the statue of General John A. Logan -- still in the same location today -- showing how much the lakefront has changed in this area along in the past century.